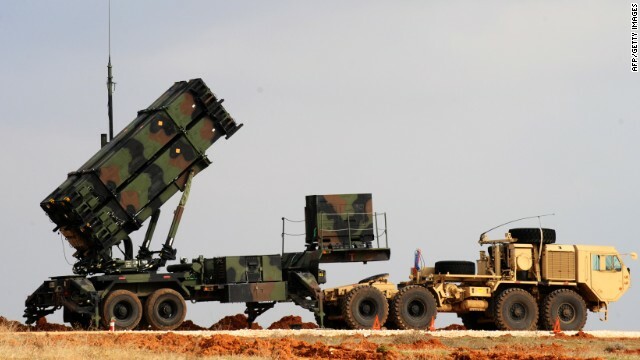 A Patriot missile launcher system is pictured at a Turkish military base in Gaziantep on February 5, 2013. The decision to deploy a Patriot missile battery and F-16 aircraft to Jordan was made late Friday at a meeting with top military and civilian Defense Department officials to bolster U.S. military support for Jordan - a crucial ally in the Middle East - as the violence from the Syrian civil war spreads, according to a senior U.S. official, CNN has learned. The official declined to be named because of the sensitivity of the situation and also declined to say who was in the meeting. Defense Secretary Chuck Hagel has been traveling outside the United States, and it could not be learned if he attended via teleconference, although several officials tell CNN he was aware of the discussions and approved the deployment. The overall goal is to demonstrate U.S. military support for an increasingly fragile Jordan, which is bearing the burden of hundreds of thousands of Syrian refugees and a growing potential threat from extremist elements including an al Qaeda affiliate organization operating inside Syria. The weapons systems will be sent initially as part of a military exercise called Eager Lion, planned for later this month, with an understanding they may stay in the country. There is clearly a broader message being sent, according to U.S. military officials. "In order to enhance the defensive posture and capacity of Jordan, some of these assets may remain beyond the exercise at the request of the government of Jordan," Lt .Col. T.G. Taylor, a spokesman at the U.S. Central Command, told CNN. The Patriot missiles were originally expected to be sent from their base at Ft. Bliss, Texas, but the senior official said they may simply be redeployed from Patriots already in the Middle East. Jordan does not face a Scud missile threat from Syria, but the deployment comes amid growing concern that some Syrian missiles are being shipped to Hezbollah and could be used to attack targets across the region. In recent days, violence has spread to Lebanon, and Israeli forces have increased security along their northern border. The F-16s and air crews will train with Jordanian combat air forces amid growing pressure from some in Congress for the White House to support a no-fly zone over Syria. Separately from the exercise, the United States is sending 200 military planners from the headquarters of the 1st Armored Division at Fort Bliss to Jordan to assist in long-term planning with Jordanian forces in case a chemical weapons crisis erupts, or if a wide scale humanitarian relief mission is ordered. A strong online presence has hardly ever been more important. Good one.